We are planning a trek to Fort Peb or Vikatgad on Saturday, October 9th, 2010. We'll be starting from Thane station. Those who are interested in joining us, may register with their details here, and we'll get back. 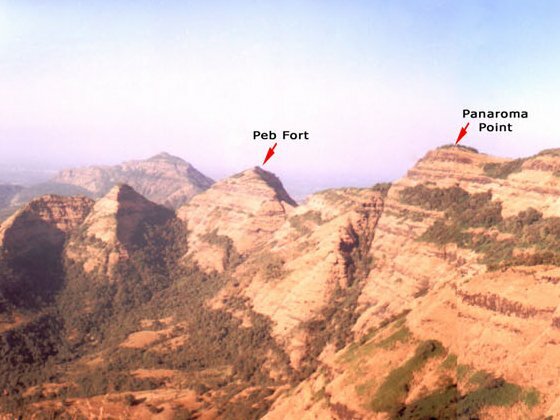 Location : Peb is a fort located near Neral; between Panorama Point (Matheran) and Nakhind, to be precise. The actuals. Mostly - auto rickshaw, train tickets, bus tickets, chai etc. We'll see whether it's convenient to pool it, before the start. Read this. It is a moderately easy climb (a bit more difficult than Peth), and is good for beginners. There is a well maintained cave on the fort. The cave is occupied by disciples of Shri Swami Samarth. One of the adventurous tasks in this trek is to climb a wall of the fort. And a metal ladder is available for support. A beautiful waterfall on the way is one of the many attractions here. There is a ridge that connects mountains of Matheran with Peb, and one can trek to Matheran. We'll take this route and reach Matheran by Saturday evening. During the climb from Neral, Prabalgad, Kalawanti durg, and Irshalgad are visible towards the left. In right one can see Haji Malang, Chanderi and Nakhind. Right now flexible, will update when decided. Tentatively, 6:00 am at Thane. To know more about us, go here, or visit our personal sites linked in the copyright notice below. * All starred content is not ours. The credit for them goes to the websites linked by each of the respective links.